Is that Pie on your Face??? 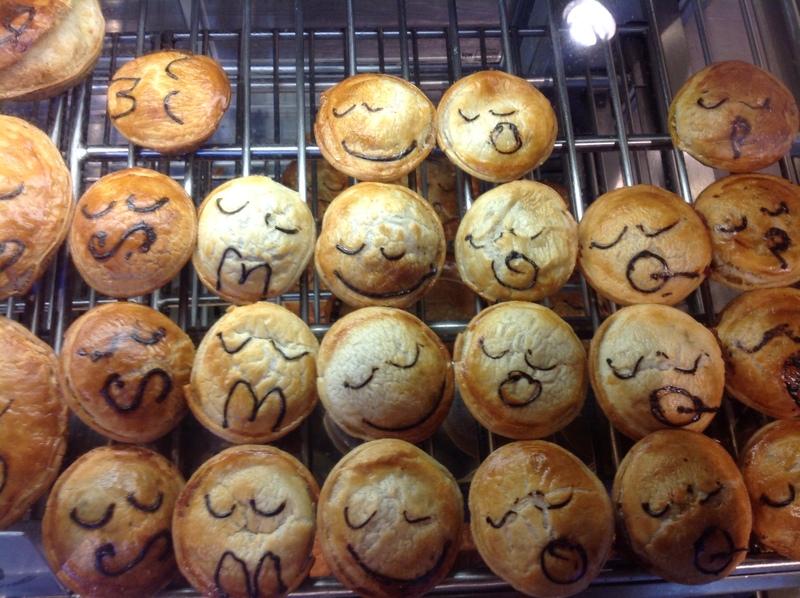 Pie Face is an Australian café specializing in savory and sweet pies. They started expanding to North America, specifically New York in 2013 and are coming with a vengeance. 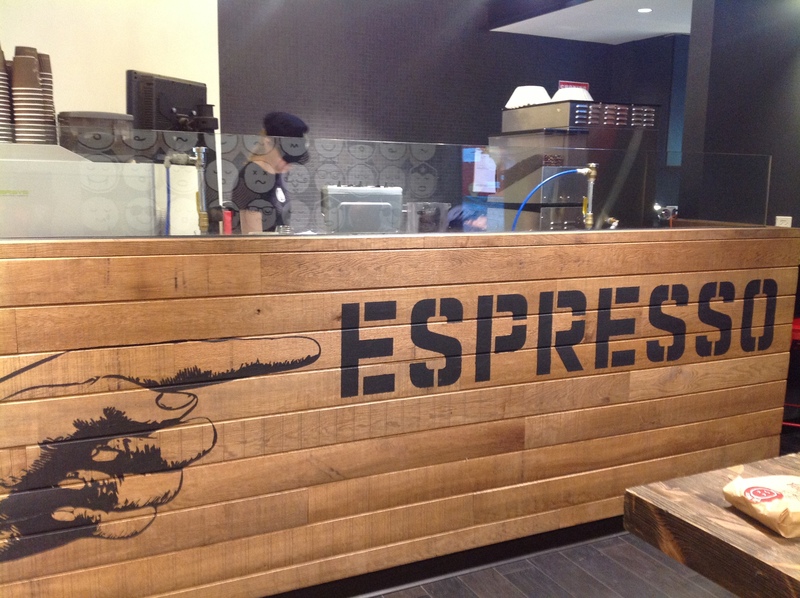 They have opened 5 locations so far and are serving up pie and “flat whites” 24 hours a day. In case you are as ignorant about Australian food as I am; pies in Australia are what hot dogs and hamburgers are to America. You can find them at sporting events and family and social gatherings. It is a culinary pride for Australia. Speaking of pride, Pie Face makes all their pies by hand and bakes them fresh throughout the day. They are made with fresh ingredients, Aussie beef and a flaky crust. They are damn tasty! All of the pies come with a unique hand-drawn face on them that tell you what’s inside. The key is in the mouth, S = steak, M = Mince, V = veg… How cute! If you have a sweet tooth, they also have an assortment of sweet pies and pastries. I had the pleasure of tasting the mini chocolate pie and pecan pie, oh my! In addition to the amazing assortment of savory and desert pies, Pie Face serves up coffee designed to kickstart your senses. One of their specialty drinks is a “flat white”, which is pretty much equivalent to a cappuccino. I recommend trying it out one sluggish morning. They also offer unique coffee blends such as “Kick My Arse”, “Start My Heart”, “Open My Eyes” and “Still Asleep” that range from a strong kick to a more mellow, gentle kick. 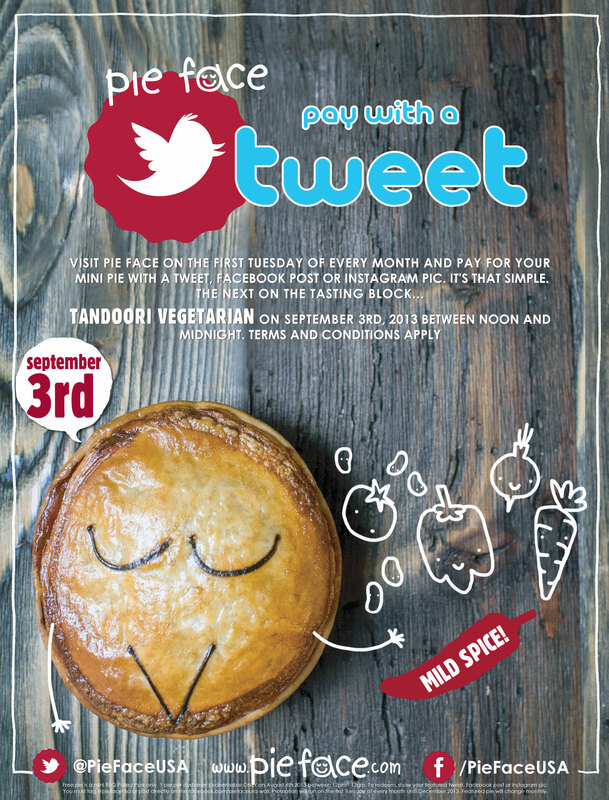 Pie Face has a monthly “Pay with a Tweet” program where if you visit a Pie Face location on the first Tuesday of every month, you can pay for the featured pie with a Tweet, Facebook post or Instagram pic. It’s that simple. Next on the tasting block is my favorite, the Tandoori Vegetarian pie on September 3, 2013. Nice article…very exciting to see innovative new food items emerge from the blending of different world cultures!